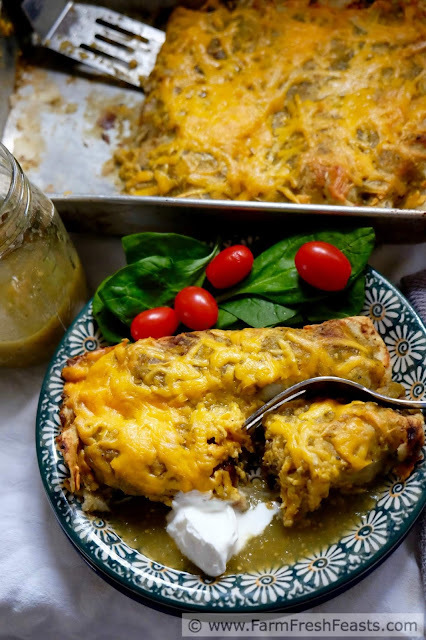 Creamy mashed potatoes and tender tatsoi greens, flavored with caramelized onions and salsa verde, fill these vegetarian enchiladas. 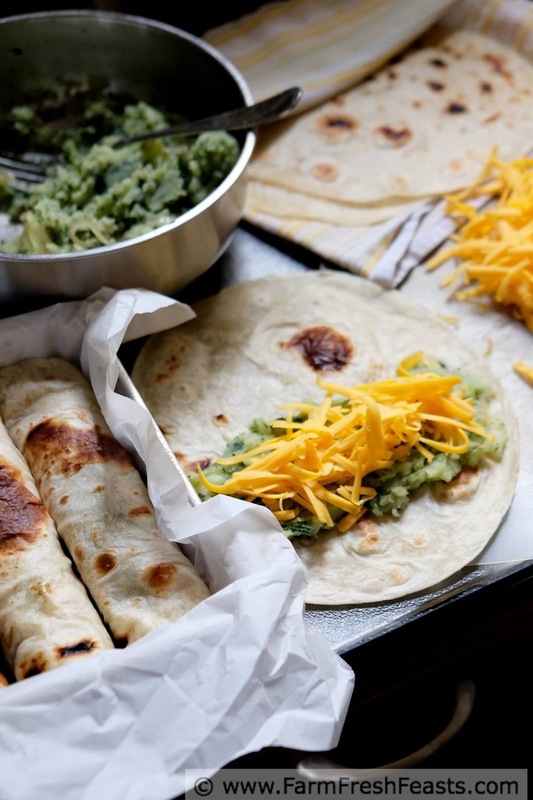 Topped with plenty more salsa verde and cheese, it's a filling meal. You can make this dish ahead, freeze it, and thaw it to bake later. I did--just to see if it worked and report back here. In the months after the fresh farm share vegetables are long gone, when there's at best one pie pumpkin left in the Strategic Winter Squash Reserve, I turn to my freezer stash to keep us fed. I frequently freeze components of meals like pesto, caramelized onions, pizza dough, or grilled vegetables. I'll thaw and use these components later in the year, one of the ways I feed my family local foods throughout the year while living in a place with winter. Freezing entire meals, though? Not my usual style. However, I had plenty of filling and tortillas and only 3 eaters while my spouse was deployed, so I figured instead of loads of leftovers I'd try freezing a pan of these to eat later. It worked. You can do this, too. These enchiladas are very comforting. The mashed potatoes and tatsoi are nicely spiced by the salsa verde, but it's not too spicy. Both times we've had these, my daughter has gone back for seconds and hogged the leftovers for lunch. The filling is dairy free, so making this dish dairy free throughout would be as easy as using your preferred dairy free cheese. If you'd like to spice it up a bit, add some green or red hot sauce for more of a kick. Want more crunch? My spouse topped his plate (the one I photographed) with a bunch of tortilla chips. It was pretty good. Apparently I have quite the thing for vegetarian enchilada fillings, stretching all the way from Avocado to Zucchini. [I know I have quite the thing for salsa verde--since I had a hard time sourcing local tomatillos last year, I picked up 3 plants at a recent plant sale so I can grow my own. Coupled with roasted Hatch chiles from the local grocery store, I'll put up plenty of salsa verde for us to enjoy throughout the year.] 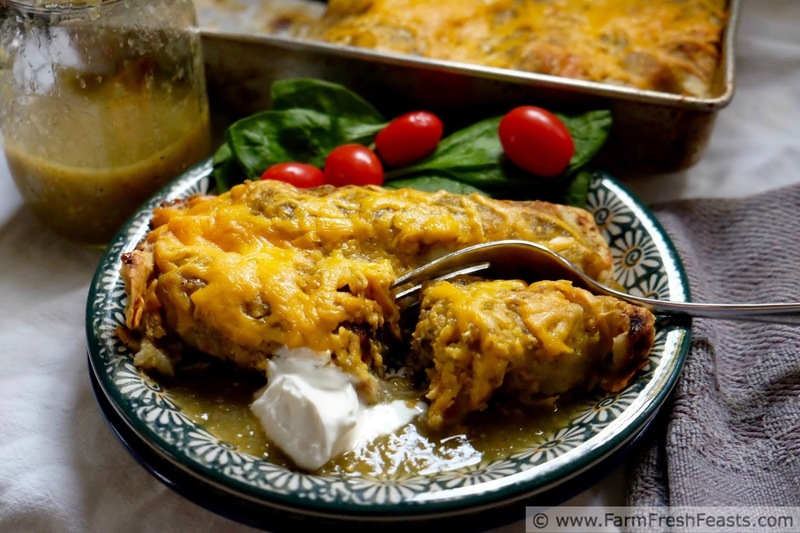 On this site I also have recipes for creamy Avocado & Pepper Enchiladas, Butternut Squash and Caramelized Onion Enchiladas, Easy Cheesy Vegetable Rice Enchiladas, Roasted Sweet Potato & Onion Enchiladas, Turnip Enchiladas, and Zucchini & Refried Bean Enchiladas. These enchiladas use a new-to-me-from-the-farm-share green, tatsoi or tat soi. It's in the family with pac choi and Bok choy. This mild green can be eaten raw in a salad/smoothie, or sautéed, or briefly simmered like I've done here. 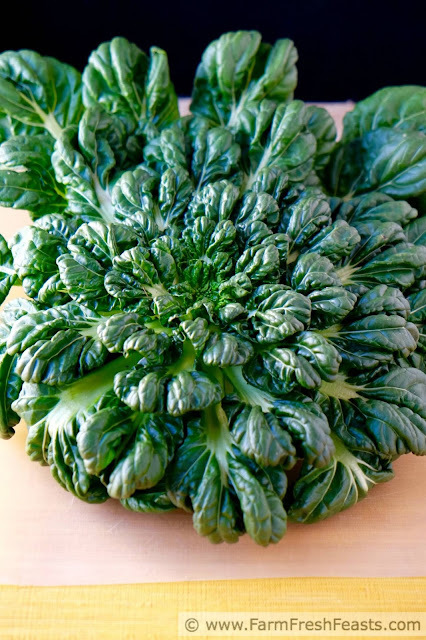 For more recipes using tatsoi, please see my Recipes for Cooking Greens Collection. For more recipes with potatoes, please see my Potato Recipes collection. These collections are part of the Visual Recipe Index by Ingredient, a resource for folks like me eating from the farm share, the farmer's market, the garden, the neighbor's garden, and great deals on ugly produce at the grocery store. Preheat the oven to 350 degrees Fahrenheit if you are baking this today. If you are planning to freeze this, instead line a 9x13 pan with a piece of parchment paper with plenty of overhanging edges as shown. Preheat a large pot of salted water over medium heat as you peel the potatoes. Place the peeled potatoes in the pot, cover, bring to a boil and cook until the potatoes are tender when you pierce them with a fork, about 30 minutes for me. Drain the potatoes and tatsoi. Squeeze (or spin in a salad spinner) the tatsoi really well to get out as much water as possible, and chop the leaves and stems finely. 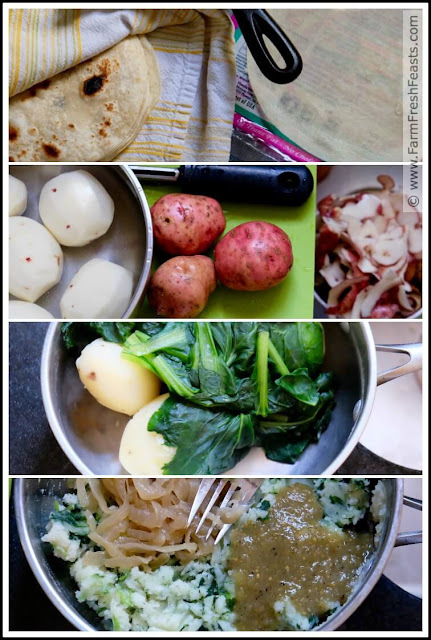 Mash the potatoes and stir the chopped tatsoi into the mashed potatoes. Add caramelized onions and salt to the potato mixture, stir. Add ⅓ cup salsa verde to the potato mixture and stir well. The mixture will be dry. Spray a 9x13 inch pan with some oil spray, then spread salsa verde across the bottom in a thin layer, about ¼ cup or so. Spread ⅓ cup of the potato filling across the one side of a tortilla as shown above. Top with ¼ cup of shredded cheese. Roll up. Place seam side down in the prepared pan. 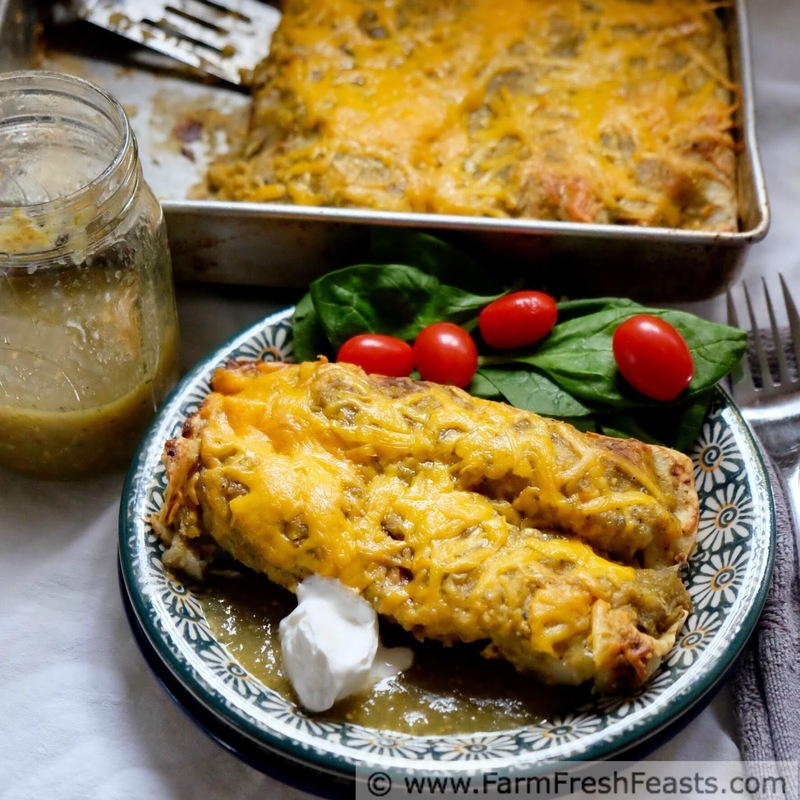 Once all the tortillas and/or filling are used up, brush the tops of the rolled enchiladas with more salsa verde. Top with more shredded cheese. At this point you can freeze the enchiladas. 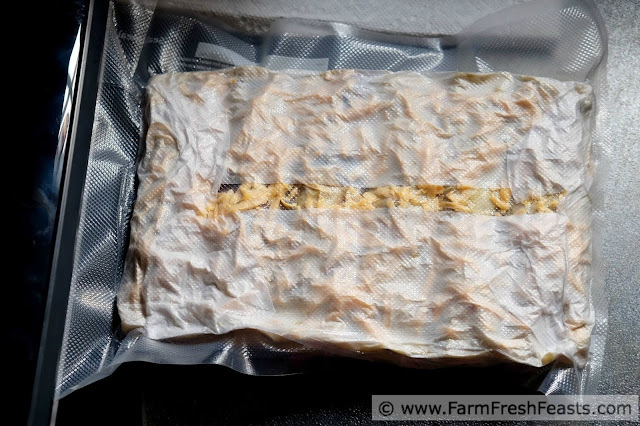 I put the pan in the freezer for a few hours, lifted the parchment paper out of the pan, and sealed the wrapped, pan-less casserole in my vacuum sealer. Six months later I thawed it overnight in the fridge, forgot to spray the pan before unwrapping the thawed enchiladas, and added more cheese and salsa verde on top. Bake for 30 minutes (up to 45 minutes if straight from the fridge) until cheese is melted and bubbly. Serve with additional salsa verde and sour cream, maybe some hot sauce for more of a kick, and tortilla chips for crunch. You do have a lot of vegetarian enchilada recipes and I for one am grateful, since I've made a handful of them already. Should I ever get tatsoi, I'll be putting this recipe to use. I think you could make it with many different cooking greens. I've just been handed a bag of kale (I sound like I'm an announcer or something) and I'm eyeing kale in an enchilada. . .